Elmwood Stock Farm, so near my house in the center of Lexington, produced this certified organic, pastured chicken. The farmers at Elmwood inspire me with their passion for soil and all it yields, and the deliciousness and intense flavors of their perfectly grown foods continue to astonish me. Avocado and other exotics from places warmer than Kentucky mix with homegrown and locally grown foods in many meals at our house. Thanks to Good Foods Coop for 46.5 years of bringing thoughtfully grown foods from the world to central Kentucky. A bed of Elmwood Stock Farm microgreens (a new treat) and a grapefruit (courtesy of Good Foods) wait for avocado slices and chopped toasted pistachios—and yield a late winter/early spring salad to remember. Caps from tall bottles from my kombucha-making experiments: fun with home chemistry in the kitchen, though I have given up this particular quest. Salts from the world. I’ve come late to the discovery of the affordable delights of different salts: Celtic gray for stovetop cooking, La Baleine fine sea salt for everyday sprinkling, Diamond Crystal kosher for baking, Maldon for exquisitely tender crunch, Murray River (Australia) for connection with the loved one who gave it to me. I wait in hopes Kentucky salt will soon be an option. West Virginia’s J. Q. Dickinson Salt-Works can lead the way. Thrive Kombucha, which I have just discovered near me at 810 North Limestone in Lexington, makes bracing healthy brews, keeps five on tap and relies on returnable bottles. Cole & Mason’s Derwent pepper mill. It works and works and works. Seven years and counting in our kitchen. Cheers for a straightforward, sturdy, functional, attractive, affordable, wonderful pepper mill. Ahhh, there in the sugar bowl rests the exquisite small silver spoon my beloved friends in Germany sent for my high school graduation. What a splendid gift, still pleasing and serving people more than 50 years later. My happy new red mixer, necessary once we finally wore out the motor of our trusty Braun Five-In-One—another gift that proved priceless. Useful, simple, specific tools make cooking wonderful; the citrus juicer, whisk and flat glass salad bowls are good examples out of many in this work space. Our old, worn Mac Superior 6.5” knife, which Cook’s Illustrated recommended decades ago, accomplishes useful work every day in our kitchen. Just about always in our refrigerator: fresh lemons. Happily, after much experimenting, I found an organic homemade gluten-free flour blend that works for many purposes in our meals. Sorghum from Country Rock, Dale variety, 2018 vintage, simply marvelous, and useful in small ways every day. Dad made the counter in 1981 when I moved to a log cabin that had not one single surface in its kitchen: just one of the literally countless ways Dad’s life, work and goodness support me and my loved ones every single day. Life, richness, love, gratitude, flavor, connection, good work, skill, beauty, farming and orchards, small producers, giving and receiving, honoring loved ones, cherishing friends, good fortune: so many forces come together in any meal. This one happens to make the point particularly well. Bonus: And what was for dinner? 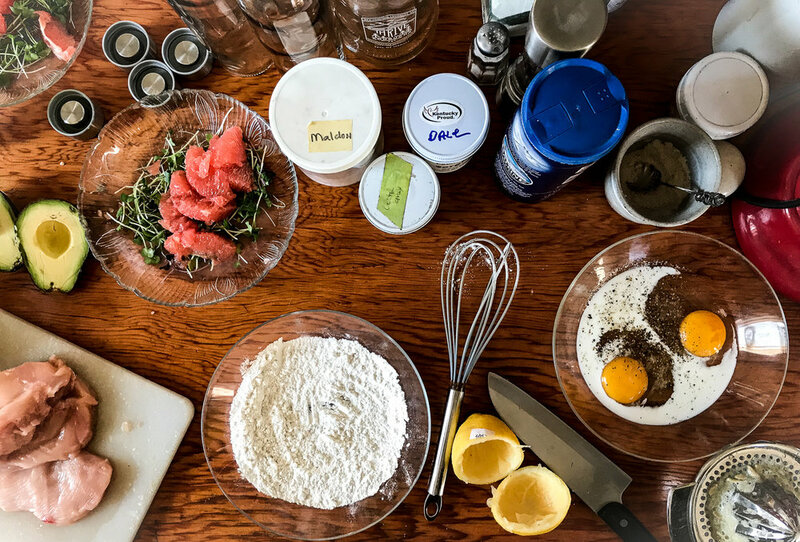 The 2018 most downloaded New York Times recipe: Chicken Francese with a slight modification away from wheat, that microgreens/grapefruit/avocado salad about to be assembled in the photo, and organic Thai Jasmine rice. Maybe a little of Thrive’s eery, icy, exhilarating, strange blue kombucha to keep the palate fresh.